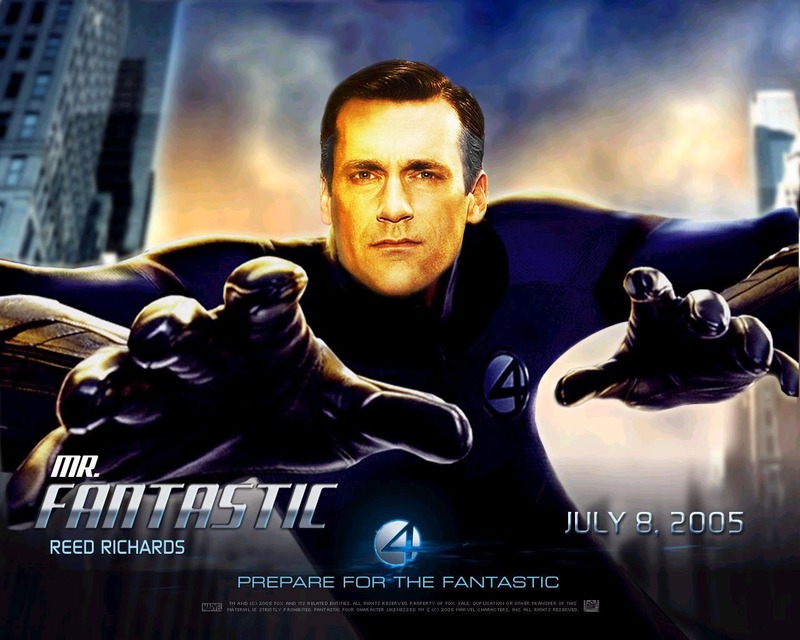 Anyone casting a cursory glance over this blog may have noticed I'm a bit of a fan of a certain Man of Steel. I'm also a fan of the work of J. Michael Straczynski, largely due to his long run on Amazing Spider-Man. While there are a few dodgy bits to say the least I would argue that JMS' Spidey run rescued the character from a quagmire of '90s mediocrity and really moved the character forward, at least for awhile. You can imagine then, how excited I was to learn that JMS was a massive Superman fan and was taking over writing duties on the main Superman title. I enjoyed the New Krypton storyline that preceded JMS but it's fair to say that the storyline sagged in the middle and went on just a little bit too long. I was ready for something different from Superman, something that would push the character forward while simultaneously reminding me of why I loved the character in the first place. With Grounded JMS seemed to be promising just that. JMS promised to take Superman "back to his roots. Bring him back to the soil that nourished him, literally and figuratively. 'Pin him to the Earth,'....Let him set out on a journey across America, on foot, so that we can see ourselves in his eyes and he can see himself in ours, and gain a better understanding on both sides as to who we are, who he is, and where we’re going." 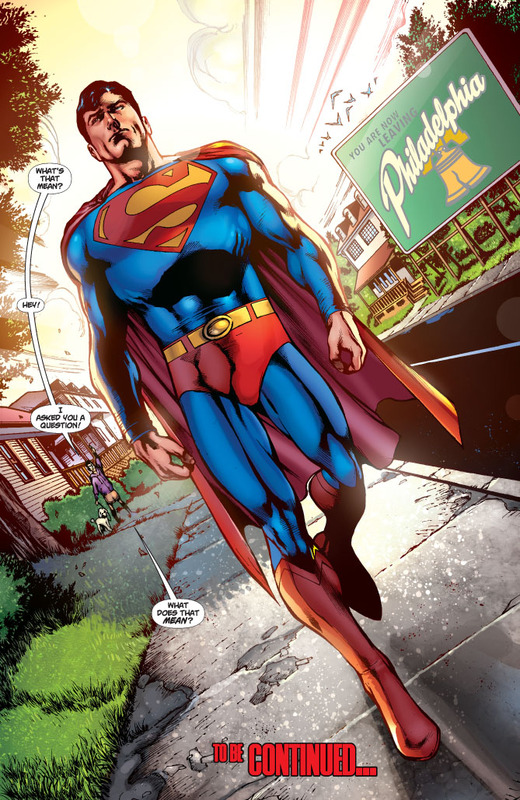 Grounded was to be a story about Superman walking across the U.S.A, a different State for every issue. Along the way he would attempt to reconnect with the ordinary people of the Earth that he felt he had neglected while fighting cosmic battles above their heads. I thought it sounded like an interesting idea and was eager to see what JMS made of it. I was however, in a minority. The internet was awash with fans dismissing the story as a failure before one page of it had even seen print. And unfortunately JMS just went ahead and proved the buggers right! The internet is full of bloggers offering their tuppence worth on why Grounded just hasn't worked. The most interesting article I've read on the subject was by Comics Alliance's Jason Michelitch who named the storyline the worst comic of 2010. While I don't feel it's the worst comic of 2010 (Justice League: Rise of Arsenal has to take that crown) it's hard not to agree with Michelitch's main point of contention with the story. From the very beginning of the story JMS is on the defensive. Practically every word out of Superman's mouth is an attempt by JMS to justify this storyline. In Michelitch's words the story "has a very clear message: Anyone who criticizes this comic is stupid and shallow and should shut the hell up." If JMS had shut the hell up and allowed the story to be judged on it's own merits he could have got away with it, but instead he chose to lecture his readers with pretentious speeches about Henry Thoreau. How can Superman reconnect with the common man if he's coming across as smug and preachy? The worst scene in the story so far has to be the bit in issue #701 where Superman flies a big fat reporter (who's blatantly meant to represent JMS' internet critics) into the sky for daring to ask why Superman wants to walk across America in the first place. This scene was pure self indulgence. If JMS is so bothered about what nerds say about him on the internet then I would much prefer him to take the Jay and Silent Bob Strike Back route and track down each negative blogger and beat the crap out of them on their doorstep. At least that way he'd get it out of his system and I wouldn't have to read such bitchy, pointless rubbish in my comics! There's another problem with Grounded that isn't really JMS' fault. 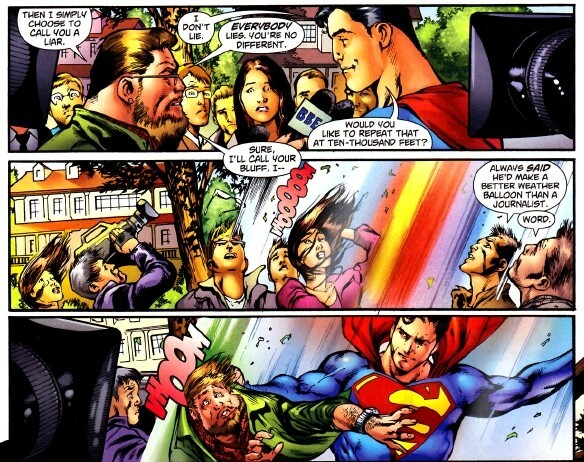 The whole Superman-wracked-with-doubt thing has already been done fairly recently, indeed it was a prominent theme in 2005/2006's Infinte Crisis. We really didn't need to see this theme readdressed a mere four years later, even if JMS is addressing it in a different way. In my opinion Greg Rucka wrote the last word on the 'troubled with doubt Superman' just before Infinite Crisis with the brilliant and under-rated Ruin Revealed storyline. Rucka poses Superman an impossible question; what if you had no choice but to kill a villain in order to save lives? Without spoiling too much, Rucka's solution is simple. Other heroes may have to face this choice but Superman will always find another way because, quite simply, he is Superman. After seeing Rucka have Superman lay many of his doubts to rest in such an entertaining way I'm finding it difficult to see the character once more questioning his role. It's not all bad news though. There are two things that have stopped this comic being the worst of 2010, at least as far as I'm concerned. The first is Eddy Barrows artwork. While Superman is busy being a preachy knobhead the only thing that stops me from attempting to reach into the page and give him a slap is Barrows' art. Barrows has been expressing Superman's doubt as a sort of subtle, quiet sadness which really imbues the character with dignity. Under Barrows' pen, JMS' preachy dialogue almost works. Almost. Grounded's second saving grace has been issue #705. JMS shows us a young boy eagerly awaiting Superman's passage through his town as he hopes Superman will save him from his abusive father. Superman has been psychically attacked by an unknown foe during a dream and the injuries he sustained have physically manifested themselves in the form of a black eye which Lois has covered with make-up. 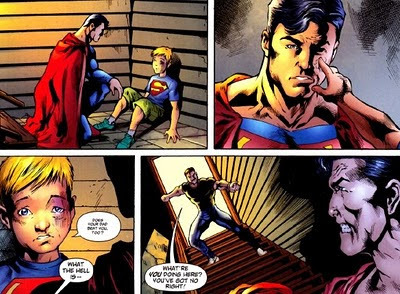 When Superman eventually passes the boy's house the boy is locked in the basement and Superman almost misses his cries for help. Of course he hears them just in time and rescues the boy. When the boy notices Superman's concealed shiner he asks "Does your Dad beat you too?" The whole issue is so well written that despite knowing that Superman was inevitably going to rescue the boy I was on the edge of my seat as he passed the house. When the boy asked Superman his question my heart broke and I couldn't wait to see Daddy getting a well deserved kicking. Granted, it's a bit of a simplistic view of a very serious issue (a charge that can be levelled at most of the issues that JMS addresses during Grounded) but JMS played my emotions so well that I'll forgive him this time. Of course despite this, the biggest problem with Grounded is that JMS has buggered off halfway through and left some other poor sod to cobble together the rest of the story from his notes! To be fair JMS has left to concentrate on the second instalment of the far more satisfying Superman: Earth One, so at least he's concentrating on a Superman story that is working. And Chris Roberson seems to be doing a pretty good job as JMS' replacement so far. With Roberson at the wheel, JMS' preaching and defensiveness are no longer a factor and the story has been the better for it. So as a return to Superman's roots and an attempt to connect Superman with the common man once more, Grounded has failed. But with J. Michael Straczynski's ego now taken out of the equation, we may at least get an enjoyable story out of it. Recently Marvel Comics have killed off the Human Torch. Many have seen this as just another cheap, lazy stunt to stir up a bit of attention. I have to say, if that's the case, it's worked on me! I've found myself wishing not for the first time that I'd been collecting Jonathan Hickman and Steve Epting's Fantastic Four run. I've heard great things about it and the issue where the Torch kicked the bucket sounds amazing. But all this attention directed towards the FF has set me off once again thinking about two of the biggest disappointments I've ever encountered in all my years as a comics fan. I can safely say that Tim Story's Fantastic Four movies are two of my greatest disappointments as a comics fan. I've only ever seen the first film once but I own the second on DVD and will occasionally watch it just to torment and frustrate myself. They're not just bad films, they're bad films with flickers of unrealised potential. This makes them worse than bad, because you know that they could conceivably have been half decent films if certain avenues had been explored in more depth. The biggest thing lacking from these two films is imagination and for a film based on work produced by Stan Lee and Jack Kirby at their creative peak, that's just an unforgivable sin. The first film is easily the worst of the pair. For a start they don't actually do any super-heroing! The FF's first major escapade involves stopping the Thing from having a tantrum on a bridge, their second escapade involves a battle against Doctor Doom. In both cases they're just cleaning up their own mess! As for Doctor Doom, he's just a joke. If Julian McMahon wanted plenty of face time on screen, then he shouldn't have gone for the part of the dude famous for wearing a metal mask AT ALL TIMES! But even a maskless Dr. Doom would have been forgiveable if the character's personality had even remotely resembled the arrogant, regal, short tempered, dignified, complex nutjob that we've grown to love in the comics. I don't know who this slimy guy with the weird eyebrows was but he was not Victor Von Doom. 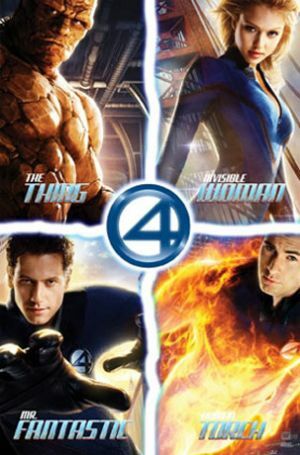 Chris Evans and Michael Chiklis are spot on as the Torch and the Thing. Chiklis seems as if he's stepped right out of the comic page and Evans makes a cocky, annoying little git seem very likeable and funny through sheer natural charisma. The fact that they're so good makes the rest of the crappiness around them seem all the more frustrating. Ioan Gruffudd and Jessica Alba are worse than McMahon. McMahon gives an awful, hammy performance but at least he's trying. Gruffudd and Alba are just bland and dull. The second film is a little better. The Silver Surfer is spot on and scenes like the Torch/Surfer chase or the London Eye rescue are genuinely exciting and fun to watch. Evans and Chiklis are even better in this film and the scene where they trade powers is hilarious. Gruffudd and Alba however, are still like two charisma vacuums. 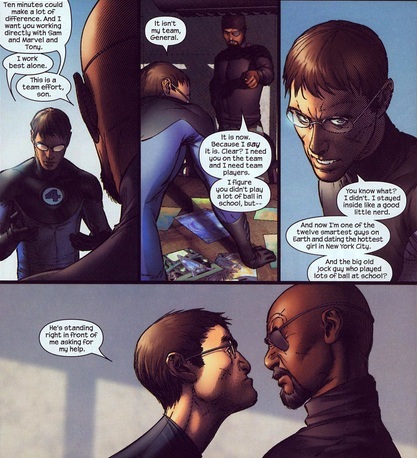 There's an awful bit where Mr Fantastic has a bit of dialogue that's been nicked straight from Warren Ellis' Ultimate Extinction. Coming from Ellis' Reed Richards It's a great little speech but Gruffudd makes it sound like the corniest thing you've ever heard. Oh, and Galactus is a cloud. 'Nuff said. This would be nothing to do with the story, it was just another normal day for the FF. 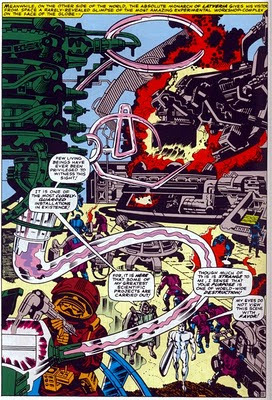 This kind of awesomeness was the stuff going on in the background of Lee and Kirby's FF. 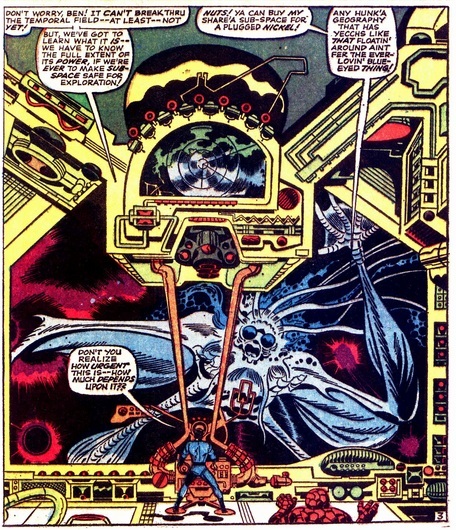 In the main stories we had Galactus (a giant being from before the Big Bang who ate planets), the Black Panther (ruler of the scientifically advanced African nation of Wakanda, whose people hold the secret of Vibranium, the metal that absorbs kinetic energy), the Inhumans (genetically enhanced superhumans whose leader, Black Bolt can cause untold destruction with a whisper), not to mention the Watcher, Prester John, the Red Ghost and his Super Apes, the Kree, Blastaar etc etc. There was creativity overflowing from each issue. To make an uninspired, bland, run of the mill, bog standard Hollywood super-hero romp from all this genius is nothing short of a travesty!